The Cumberland & Dumfriesshire Farmers Mart P.L.C. had forward 2,594 store hoggs, 347 commercial breeding sheep and 28 pedigree in lamb females at their Sale at Longtown on Tuesday 21st January 2014. Another fine show of store hoggs was forward to the usual ring of seasonal buyers. The hoggs were maybe not the strength of previous weeks but sold at recent high rates. Cast rams to £64 for North Country Cheviot from High Lodore; Charollais £60 Cowcorse. Cast ewes to £55 for Texels from Arnmannoch; Cheviot Mule £54 Arnmannoch; Greyface £50.50 Soonhope; North Country Cheviot £46 Dobcross Hall; Hill Cheviot £42 High Chesters, £40 Thompsons Walls and Mount Pleasant. Also forward today were 347 commercial breeding sheep, where all classes sold at decent rates to a full ring of buyers. Younger sheep keenly sought after. The sale was topped at £160 for a pen of 10 Texel two crop ewes in lamb to Beltex from W. Gribbon & Co., Waterside, selling to Messrs Ireland. Shearlings – Texel £126 Barmurrie, £120, £110 Waterside, £104 Barmurrie; Lleyn £92 Nisbet Smithy House. 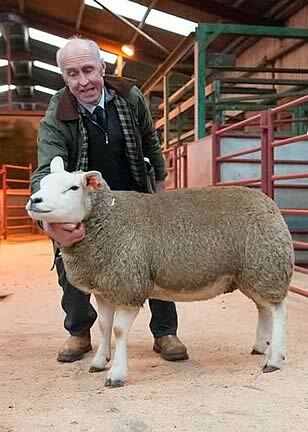 2 crop ewes – Texel £160 Waterside, £138 Hill Court; Cheviot Mule £100 Hill Court. 3 crop ewes – Texel £132 Balmurrie, £124 Waterside, £106 Barmurrie; Greyface £128 Waterside, £104 Barmurrie. 4 crop ewes – Greyface £102 Waterside. Correct below ewes – Lleyn £79, £77, £73 Girdstingwood. Today the firm also held its Inaugural Sale of Pedigree in lamb females alongside the sale of commercial in lamb sheep. The 28 pedigree females forward for our first sale averaged a very pleasing £416 per head. We hope to make this fixture bigger and better each year now that our first try has been a success. Topping todays sale was the Bluefaced Leicester section where the first gimmer from Messrs J. Wight & Sons, Midlock sold for £1,700. This gimmer was by 3320/B4 Tanhouse and sold in lamb carrying triplets to 1538/W25 Midlock Controversy. The final bid on this sheep was made by Mr McQuiston, Barnshangan. 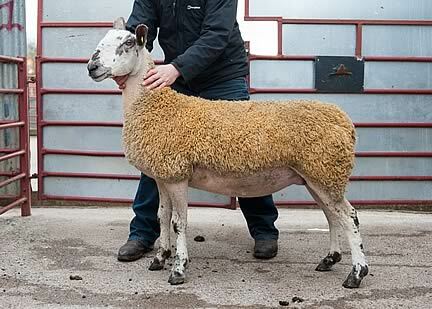 Two other Midlock gimmers sold at £500 and 3400 both to Mr McKie, Finniness. In the Texel gimmer department trade was buoyant from the off with a full ring of buyers ensuring the first time sale went off with a bang. The Texel section was topped at £550 for a gimmer from S. Renwick, Craig Douglas, his number 2 gimmer by Livery Predator sold carrying twins to homebred ram, Craig Douglas Uther and was purchased by Charollais breeder J. Wales, Thackwood. Mr Renwick sold another two gimmers at £520 firstly to Thackwood then to Messrs Graham, Upper Mains, both again in lamb to Uther. Mr Warnock, Sandilands realised £450 for his forth gimmer by Watchknowe President and sold in lamb carrying twins to Castleknowe Uncle, purchased by Messrs Lewis, Wales.